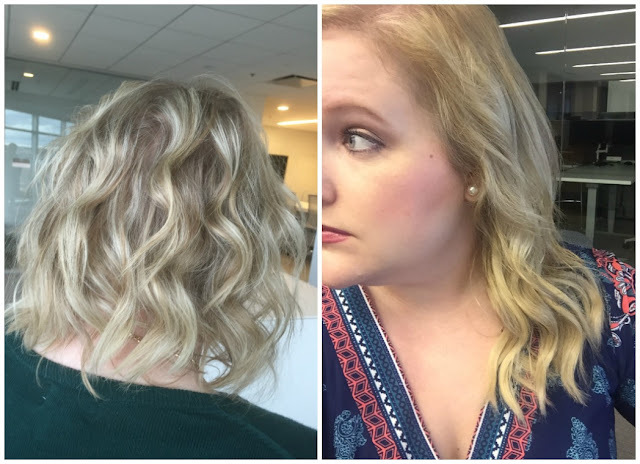 My hairdresser sister has been wearing hair extensions for years and though I loved the idea of longer and fuller hair, I wasn't sure I was hair savvy enough to use hair extensions...at the least not the kind she used. But after I recently cut my hair very short (on a whim) and hated it (doesn't that always happen??) I decided bite the bullet and try them. I asked my sis about brand and type since she was the expert. She recommended a full set from Milk + Blush. After some back and forth with their customer service for color selection (I had to send them pictures of my hair so they could help me choose a shade) I ordered them. For reference, I ordered this set in the shade Slayer. 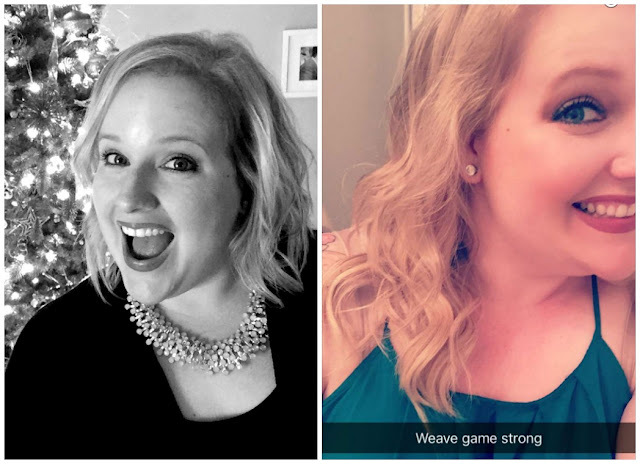 I ordered the 12-14" set because though I wanted to add length to my hair, I didn't want it to look very obvious that I had put extensions in. Once they arrived I verified that they were the correct color with my stylist (sister) and took them to her to be professional cut. This part is very important with hair extensions. You must have a professional cut them with layers that will blend into your hair. I already had layers so she just had to trim these to blend in. Once we got these in, we realized that while they matched the ends of my hair perfectly, they were a little off on my roots. This wasn't a big deal and wasn't super noticeable but I still wanted them to match so I scheduled an appointment for her to match my roots with the extensions exactly. I couldn't be any happier with my extensions. I wear them almost every day (except when I'm just bumming around the house) and the best part is that I can take them out whenever I want. I take them out in the evenings when I get home and the put them back in the mornings. I love them! The first day I started to wear them no one really said anything...which made me nervous. Then a few people said "wow your hair has gotten so long! It looks great!" The fact that they couldn't tell it wasn't my real hair is a huge compliment! Note: I wasn't compensated by Milk + Blush nor was I given goods in exchange for a review. This is just my pure, honest opinion. I've never tried other brands so I can't compare but I'll say these are amazing so far! For the record I like your hair as is without too! BTW... your short hair is SO cute on you!